THE CHINESE "LORD OF THE RINGS" - NOW IN ENGLISH FOR THE FIRST TIME. THE SERIES EVERY CHINESE READER HAS BEEN ENJOYING FOR DECADES - 300 MILLION COPIES SOLD. The Song Empire has been invaded by its warlike Jurchen neighbours from the north. Half its territory and its historic capital lie in enemy hands; the peasants toil under the burden of the annual tribute demanded by the victors. Meanwhile, on the Mongolian steppe, a disparate nation of great warriors is about to be united by a warlord whose name will endure for eternity: Genghis Khan. Guo Jing, son of a murdered Song patriot, grew up with Genghis Khan's army. He is humble, loyal, perhaps not altogether wise, and is fated from birth to one day confront an opponent who is the opposite of him in every way: privileged, cunning and flawlessly trained in the martial arts. Guided by his faithful shifus, The Seven Heroes of the South, Guo Jing must return to China - to the Garden of the Drunken Immortals in Jiaxing - to fulfil his destiny. But in a divided land riven by war and betrayal, his courage and his loyalties will be tested at every turn. 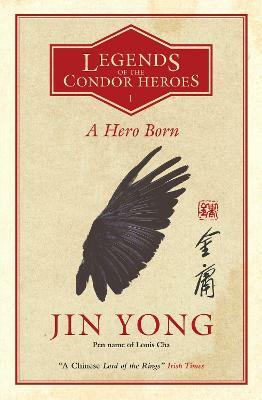 Jin Yong is one of the world's bestselling writers, with more than 100 million of his works sold (not including unknown numbers of bootleg copies). He is beloved across China for his wuxia ("martial arts and chivalry) novels, which have given rise to film, television, comic book and video game adaptations. He was awarded an O.B.E. in 1981, and is one of two authors on the MacLehose list who have asteroids named in their honour (the other being Georges Perec).